Australian Feral Starling Control & Removal. Australian Feral Management will advise on the problems associated with starlings and the alternatives methods of control. An introduced bird with an upright stance and a rapid jerking walk. First released in the 1850’s in Victoria, it is now widespread throughout eastern Australia. It’s name comes from the spangled star-like appearance of it’s fresh autumn moult. Up to 3 broods of four or five young each a year can be raised by a single pair of birds. In late summer, starlings can congregate in huge flocks (20,000 plus) and cause massive damage to crops in a matter of days. 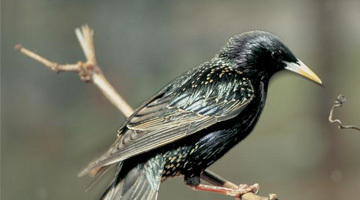 Starlings are very tough and wiry and yet show caution when dealing with man. By harassing the starlings when they land in a crop and causing them to fly away, circle around and then land again, only to be chased away again is causing them to use up valuable energy for no return. Usually after half an hour or so of this, they move on to another “easier” site. Starlings love power lines as a perch site, similarly they like large old dead trees. They usually avoid more heavily treed areas, probably to keep away from goshawks and the like which can ambush them. In the suburbs of large cities the main complaint is the lice that come when starlings start nesting in the roofs of homes.